This page is about the American medium tank M4A2. For other uses, see M4 (Family). The Medium Tank M4A2 Sherman is a Rank III American medium tank with a battle rating of 4.0 (AB) and 3.7 (RB/SB). It was introduced along with the American ground tree in Update 1.45 "Steel Generals". It is the third of the Sherman medium tank series and the last 75 mm variant before unlocking the 76 mm equipped models. The in-game model represents a "Sherman 2.0" design with the new front armour model angling at an uninterrupted 47 degree and a better cast turret. Compared to its predecessor, the M4A2 is the only 75 mm Sherman with an uninterrupted and welded front glacis sloped at 47 degrees. This eliminates most of the weak points of the earlier M4A1 and M4 models, though by this battle rating most enemy weaponry could penetrate the front glacis of the Sherman. A compensation for the better enemy is that the M4A2 Sherman has access to the T45 APCR ammunition for its 75 mm gun. Another noted difference is the loss of the turret appliqué armour on the right side of the gun mantlet. This does not sacrifice armour as the turret base armour at that location is thickened to compensate the loss. Finally, the M4A2 runs with the General Motors 6046 diesel double-engine. This does not impact automotive performances greatly, but it does changed the engine deck shape, exhaust emission, and engine noise. Suspension wheels are 15 mm thick, the bogies are 10 mm, and the tracks are 20 mm thick. A small patch on the turret front right side is thinner (51 mm) than the rest (76 mm). Ammo racks of the M4 Sherman. The general play style of this tank is to be a support tank. This tank doesn't have the armour to be on the front lines. Surviving on the front lines will be quite hard, though not impossible. Try to stay in the 2nd or 3rd line and support the team, or hide behind heavily armoured teammates and help them assault the enemy. Capturing cap zones is also good for this vehicle. This Sherman is pretty fast. Be note, be wary of T-34 and Panzer IV tanks. These have guns that can easily penetrate the M4A2's armour even if angled well. It is best to use hull down tactics, or shoot first and knock-out their gunner. T-34s are tougher and they can very easily one shot the M4A2 from the side so keep the sides protected. T-34s have thin armour but sloped, and if angled, are hard to destroy, so aim for the turret. T-34E STZ's are very hard to take it and once again, the turret. The tactics which should be used; is not to stay in the same place. Move after every shot so the enemy has to counter that move thus leaving the enemy unit exposed. 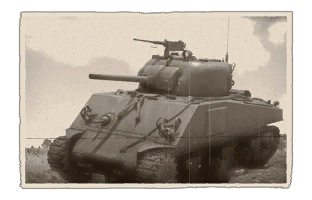 Once the M4A2 has access to different camouflages: it will be able to blend into the background (Works very well with a flanking maneuver), then wait for enemy to drive right past the tank. It is recommended to use the M61 Shot; when this happens. Step 1: Wait for them to drive past. Step 2: Locate a flat surface on them e.g. Side/Rear of a turret or tank. When in this Game Mode Game Mode: The tank is: fast, but weakly armoured. Its gun is pretty decent with enough penetration. Capture zones and support the team by firing at enemy medium tanks. The tank performs it's role as medium tank very well. It uses speed; as an advantage and very thick frontal armour. Which gives this tank, an edge over the enemy. However, It offers; some very thin armour around the side and the rear of the tank. Which can be penetrated;- by almost all the tanks in and on. So watching the sides and rear are very important, neglecting to protect them can often result in a destroyed M4A2. When engaging the enemy forces; It is recommended to turn into their fire with the front of the tank. Since the front is one of the thickest armoured front installed on a tank. This can often save the tank from its end. However, if a skilled enemy player aims for one of the critical components of movement, such as the tracks, engine, transmission, or the driver, they could stop the M4A2 from performing this action. A weak point of this tank is the machine gun port on the front. A single well placed shot could end the tank. It is advisable to research Parts first, then Fire Protection Equipment, then the M62 Shot Round. Decent 75 mm gun with APCR. Sloped, uninterrupted front armour that can still bounce incoming shells. Lowest requirement for camouflage unlock from all Sherman variants. Thick gun mantlet, small turret also makes it a hard target. Very versatile on the battlefield. 75 mm gun is no longer a "good" gun at the rank, just "decent". High profile makes it an easy target. Thin armour, front will only work if angled very well. A good T-34 or Panzer IV will send the M4A2 back to the garage. The M4A2 Sherman model ran on a GM 6046 diesel engine. 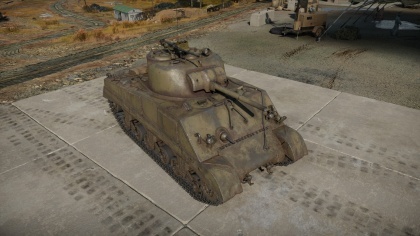 The Sherman model in-game is one of the later production models, featuring improvements on the turret and hull design to maximize armour thickness. The tank's hull was welded, with the earlier models having the front armour plate placed on a 56 degree sloping angle. However, this design had protrusions on the driver and assistant driver hatches that created "shot traps" as these protrusions gave less protection than the frontal armour plate. This was fixed on later models with a 47 degree angling instead, which eliminated the shot traps and made the frontal armour more effective than before. Up to 8,053 M4A2s were produced from April 1942 to May 1944, out of the 49,234 Sherman units produced in the war. Throughout the war, the M4A2 was mostly given out to other allies or used by the US Marine Corps as the US Army doctrine called for the use of only gasoline-engine Shermans such as the M4A3. The Shermans first saw combat in the North African Campaign in the Second Battle of El Alamein on October 1942 in the hands of the British. It was much quicker to reinforce the British armoured divisions with the more than 300 M4 Shermans sent to North Africa than it was to create new American ones. It proved much better than the German Panzer IIIs and Panzer IVs, able to eliminate them at distances more than 2,000 yards away. The Americans received their first Shermans in the next month in Operation Torch. However better the Shermans were to the German tanks at the time, the Allied armoured units still suffered casualties against the German tanks and anti-tank guns, most notably in the Battle of Kasserine Pass. In Italy, the Shermans proved much more mobile than the German Panzers, able to travel cross-country on the hilly terrain with ease. However, it was at this stage that the Sherman's shortcoming began to take face in the advent of the newer German tanks, the Tiger Is and Panthers. These two tanks featured armour that proved impenetrable when fired at the front, and with guns that could take out the Shermans from farther than the Sherman's effective combat range. The Shermans have to hit the side of these tanks for a penetration, and at ranges that were considered suicidal. Although programs were initiated to up-gun the Sherman with a 76 mm gun, American leaders determine that the Panther and Tigers would not be produced in large quantities and were not as great as a threat as these two vehicles could still be destroyed by the 75 mm gun and standard anti-tank equipment.